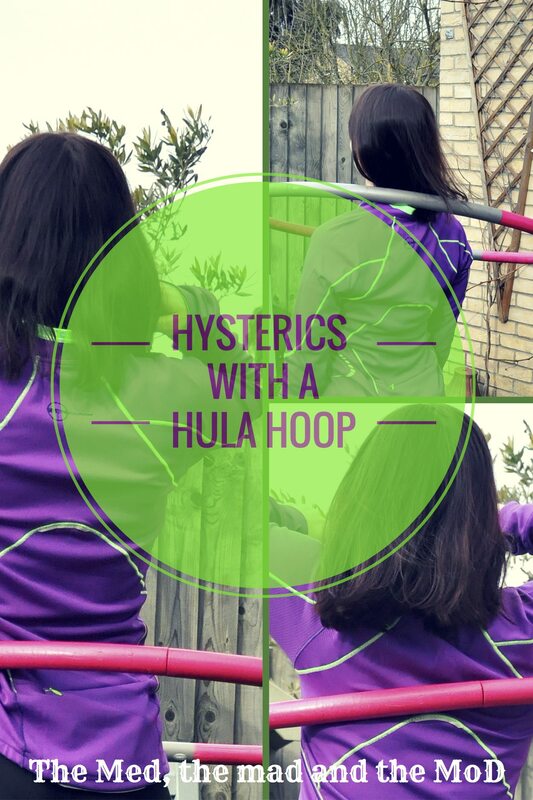 Hysterics with a hula hoop! No pain, no gain, right? That’s what I told myself when I discovered my waist was black and blue after my first day of weighted hula-hooping! I can’t recall what inspired this latest hobby; maybe it was a rejection of the approach of so-called middle-age: a desire to reclaim my carefree school days, or maybe it was just another way to get fit that doesn’t involve going to the gym! Jerking my waist in circular motions, I was pleasantly taken aback that I could keep the hoop circling my waist for a few rotations. And the more I tried, the longer it stayed up, so the satisfaction that ensued meant I overdid the first day or two; just a wee bit! Not that I realised at the time; it was the discovery of bruises on my waist the next day that gave my stupidity away! Soon I became in synch with my hula-hoop and as the jerking gradually turned into a fluid rhythm, the bruises became a faded-memory. But after a few weeks, waist-hooping was not enough and I found myself poring over you tube tutorials on how to give your whole body a workout. And there I found my quest: lifting the hula hoop smoothly from waist-to-chest. The tutorials made it look simple; so fluid and so fabulous and yet, however I contorted my body; trying to move the hoop up, it defiantly stayed at my waist. Frustrated, I read countless articles and avidly-watched tutorials in my determination to achieve this manoeuvre and yet week-after-week and month-after-month, the hula-hoop refused to budge. Throw in the odd twinge of back pain from jerking my waist into contorted positions and this manoeuvre remained a tempting, and yet, untouchable enigma. So between frustrated attempts at the seemingly-impossible, I attempted neck-hooping. Oh my! As the weighted hoop kept rotating and slamming into my windpipe, I wondered, through the pain, if I was doing something wrong, or whether these online hoopers, who make it look so easy, have de-sensitised rubber necks from months and years of neck-hooping. Not one to give up, I persevered and was soon rewarded with pain-free, neck-hooping; it was just a case of finding the rhythm! And then I had my eureka moment! Unbelievably, maybe four months later, having thought it would never happen, I finally lifted the hoop from waist-to-chest and back again and I no longer looked like a strutting chicken in the process! Fast-forward to the present day and I can smoothly waist-hoop, put my hands through the hoop to neck-hoop and then lower it back down again, as well as lifting the hoop from waist-to-chest. All without touching the hoop or letting it fall. Was it worth the months of frustration and regular back twinges? Hmm…if you want an easy way to get fit, from the comfort of your own home and that is really fun in the process, I’d say so!